These “state-of-the art” multi chamber filters offers maximum filtration with the minimum of maintenance. The 2500FG is an ideal unit for those who require a high quality, long lasting fibreglass filter. It’s compact size makes it suitable for small pond installations where space is at a premium. Its unique four chamber design incorporates a 1.5”spray bar inlet, two sumps (with independent drainage) and a 2” return outlet. The 5000VFG is a high quality, free-standing, fibreglass, four bay, filter with integral vortex designed to improve your fish’s environment. Its “state-of-the art” multi chamber ensures maximum filtration with the minimum of maintenance. The 5000VFG is a high quality, free-standing, fibreglass, four bay, filter with integral vortex designed to improve your fish’s environment. Its “state-of-the art” multi chamber ensures maximum filtration with the minimum of maintenance. The unit is suitable for fish ponds of up to 5000 litres and a maximum flow rate of 3000 litres ph. However, with lighter stocking densities or in fish free ponds the 5000VFG will comfortably cope with larger volumes. Complete with a new media package consisting of: filter brushes, Japanese matting, wadding and flocor. The integral Vortex enhances the unit's performance and reduces the maintenance intervals. It is suitable for Pump or Gravity feed. Fitted with 3” inlet and 2” outlet. The 10000V is a high quality, free-standing, fibreglass, four bay, filter with integral vortex designed to improve your fish’s environment. Its “state-of-the art” multi chamber ensures maximum filtration with the minimum of maintenance. 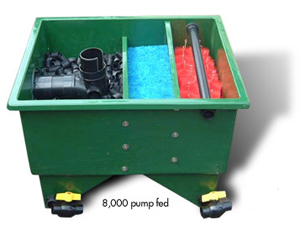 The unit is suitable for fish ponds of up to 10,000 litres and a maximum flow rate of 6,000 litres ph. However, with lighter stocking densities or in fish free ponds the 10000 V will comfortably cope with larger volumes. The integral Vortex enhances the unit's performance and reduces the maintenance intervals. Six layers of sponge with varying layers of porosity, two large foam blocks and a layer of flocor. Filled with Flocor.The large surface area of Flocor tubes makes it an ideal filter media. The pump fed model has a 4" inlet and outlet while the gravity fed model has a 4" inlet and 1.5" outlet. The 18,000V is a high quality, free-standing, fibreglass, four bay, filter with integral vortex designed to improve your fish’s environment. Its “state-of-the art” multi chamber design ensures maximum filtration with the minimum of maintenance. Eighteen 16" long x 8" diametre polypropylene filter brushes - They are of a semi-rigid construction with a wire loop at the end for easy cleaning. Blue matting - This is an excellent filter media as it has a large surface area giving it an excellent bio-mass retention. Its open texture removes larger particles from the water. Three layers of reticulated foam with different density of porosity of each layer. This is on top of a layer of approximately 2 cubic foot of flocor. Six way foam block manifold assembly on top of six cubic foot of Flocor. The large surface area of Flocor tubes makes it an ideal filter media. It has a 4" inlet and 1.5" outlet. The 20000FG is an eight chamber fibreglass design that can be used for gravity or pump fed by simply reversing the media. This is currently the largest single unit in the Yamitsu Range. Its clever design enables it to fit through a standard 30" domestic door opening (if required) so it can be transported through the house for those properties where there is no side or rear access. Suits pipe sizes of 110mm and 1.5"
Media comprises: alfagrog, flocor, filter wadding, foam cartridge, green matting cartridge, blue matting cartridge and two bays of different graded brushes. This unit does not come with a lid, you have to order this extra. The Kockney Koi VF range of Vortexs are made from long lasting, high quality fibreglass. The VF1 is ideal for flow rates up to 1000 gallons per hour (gph). The VF2 up to 2000 gph and the VF3 up to 3000 gph. Distance between bottom and centre of inlet - 10"
Distance between bottom and centre of inlet - 15"
Distance between bottom and centre of inlet - 21"
Note: All fibre glass Vortex units must be supported to a height of no less than the top of the 110 mm inlet pipe.